A description of the illustration of Atotarho in David Cusick’s 1828 book, entitled David Cusick’s Sketches of Ancient History of the Six Nations. Published at the Tuscarora Village in Lewiston, Niagara County, New York, and republished digitally by UNL Libraries. Page 23. The black-and-white woodcut print occupies about a third of the typeset page. 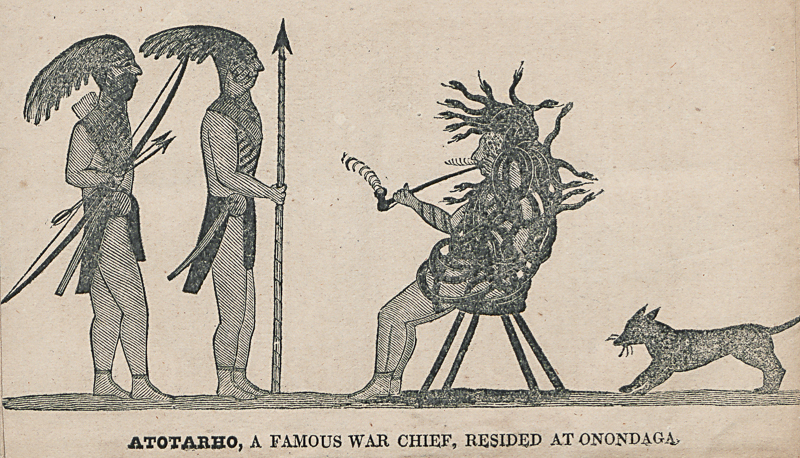 Its caption reads: “Atotarho, a famous war chief, resided at Onondaga.” The image itself depicts three human figures and a dog, with a blank background, on a small strip of ground. All of the figures are depicted in profile. At the left of the image two figures stand facing towards the reader’s right, both with feathers on their heads and loincloths, though the rest of their clothing is a little difficult to decipher. The leftmost figure carries a bow and arrows. The second from left carries a spear. They face a third human figure sitting in a chair—this is Atotarho. He smokes a long pipe and, in keeping with legendary description, is wrapped almost from head to toe in writhing black snakes. Behind Atotarho is a small dog with long whiskers, posed as though it has just run into frame from the right. The figures and ground are all filled in with the hatching typical of many printed images from the nineteenth century. Atotarho, the leader depicted in the image, was the first leader of what has become known as the Iroquois League or Iroquois Confederacy, an alliance of initially five, and later six, Native American nations that are often collectively referred to as Iroquois, but are more properly called Haudenosaunee. Atotarho, whose name is pronounced and transliterated differently in different languages, was originally chief of the Onondaga nation, which was headquartered in what is today upstate New York. A quick peek at the scrupulously cited Wikipedia page on Atotarho gives us more detailed information than what Cusick tells in his Sketches: his very name may have meant “entangled,” and multiple sources say that his body was “misshapen” and his actions were supernaturally cruel. Atotarho’s cruelty prevented the formation of a peaceful alliance of nations, and it was only after much violence, death, and pain that Onondaga leader Hiawatha and Mohawk leader Deganawidah were able to convince Atotarho to join the alliance. Part of this convincing was enacted through cleaning and healing Atotarho: combing out his matted hair (which may have been the source of the idea that he was wreathed in snakes), and smoothing out his “misshapen” body. Atotarho became the leader of the council of nations and his name has been used to refer to the leader of that council ever since. The image that Cusick has published aligns fairly closely with his own version of the story, leaving out many of the details that other versions include. The two men facing Atotarho are not named in the woodcut or in Cusick’s text, but scholars seem to presume that they are Hiawatha and Deganawidah, even though both 19th and 20th century scholars point out that their feather headdresses and the spear that one of them carries are not typical of Haudenosaunee men, either in 1820 or hundreds of years earlier when the Iroquois League was supposed to have been founded. The presence of the dog is also suspect, and anthropologist William C. Sturtevant claims that it does not belong to the Atotarho image, but to the image of a woman parching acorns that was originally printed to the right of the Atotarho image on a single sheet. Sturtevant claims that the dog appears in the Atotarho image in most copies of the book, quote, “because of the manner in which the single sheet of illustrations issued with the book was cut apart,” end quote. I’m personally somewhat skeptical of this, not having been able to find an image of the single sheet, and other scholars writing after Sturtevant also seem to accept the dog’s presence and even actively incorporate it into their analysis of the Atotarho image. Whatever the case regarding the dog, the image is a strange way of visualizing Atotarho’s story, acting more like a portrait than an illustration of either Atotarho’s cruelty or his transformation into a benevolent leader. The three other woodcuts in the book have a much clearer narrative element: the woman parching acorns has clearly shocked the monstrous flying head that stands behind her, who believes she is eating hot coals. The quote-unquote “stonish giants” depicted two pages before Atotarho clearly show two giant humanoid figures covered in a layer of jagged stone skin chasing three Native men who desperately fire arrows back at them. Even the final image in the book, an illustration of a war dance that is not connected to anything in Cusick’s text, is characterized by action and movement as the dancers contort their bodies to the beat of a drummer. But Atotarho, the terrifying snake-covered chief, sits rather calmly in a European-style four-legged chair, smoking a pipe, calmly facing two men who have an equally calm demeanor. The only real movement implied is in the energetic pose of the dog at the right, whose presence, some scholars assert, lends a sense of the real to the image through its very ordinariness, preventing a reading of the image as fantastic or impossible. Cusick appears to view the book as a public service, but never completely explains why he felt that such a publication had to be made. This ambiguity has led to uncertainty among scholars as to whether the Sketches were published primarily to profit from tourists in the Niagara area, or for the purpose of education, or as an act of resistance through preservation, or some combination of the three. In his book Removable Type: Histories of the Book in Indian Country, literature scholar Phillip H. Round discusses Cusick’s Sketches in the context of other books by and about Native Americans, emphasizing the fact that in the rare cases when Native Americans were involved in the production of printed works, either directly or indirectly, Euro-American printers erased or disguised their role. According to Round, it took a little while for Native Americans to begin using printing technology for their own purposes, with the production of missionary newsletters and Native-language newspapers beginning around 1830 and expanding through the second half of the nineteenth century. Judging by this timeline, Cusick appears to have been an early adopter, which only adds to the uniqueness of his publication. Round acknowledges the ambiguity surrounding the audience for the Sketches, but strongly suggests that one of Cusick’s primary interests was asserting Tuscarora sovereignty, enacting a form of resistance through preserving both legends and commonplace practices—Round specifically points to the ordinariness of the little dog in the Atotarho scene, and the image of a woman parching acorns, as examples of this sense of the ordinary. Whether Cusick’s Sketches were a tourist production is still technically debatable, but several factors seem to suggest that even if the book was marketed as a souvenir of some kind, it didn’t necessarily function that way. Robert Dale Parker suggests that the “7,000 copies” that the title page of the second edition states were printed was largely a marketing ploy, and that judging by the print runs of other books of the same period, the usual print run of a locally published work like the Sketches was less than 1,000 copies. In addition, despite the rise of a tourist art market for Native American objects in the first half of the nineteenth century, anthropologist Neal B. Keating states that painting and drawing were not a significant part of that market, primarily because they were viewed by white tourists as Euro-American practices not unique to Native Americans. Presumably, a book printed using Euro-American technologies, and written in English, would have been of little interest to tourists for the same reason. Travelers’ accounts of meeting Cusick cast further doubt on the circulation of the Sketches, primarily because most of them seem to discuss seeing his original paintings and drawings in person but do not necessarily remark upon his book. The Sketches’ landmark status in the history of Native American print works alone would make it worth discussing, but as Kalter points out, the Euro-American tendency to assume that Native American people and Native American concerns are a monolith, rather than composed of many different individuals with many different histories and viewpoints, makes both the Sketches and Cusick himself worthy of further investigation. Cusick’s unusual framing of Iroquoian history and his blending of Native and Euro-American influences and practices may not necessarily align with what is considered canonical or traditional, but studying outliers and those who go against the grain can be just as revealing as studying objects and people who are regarded as emblematic of a given cultural tradition or period. So I’ve brought your attention to an unusual image in an unusual book, but how does it fit into our larger understanding of art? What bearing does it have on our world today? Well, let’s consider not just how Western pop culture depicts Native Americans, but how it depicts Iroquoian peoples specifically. Again, Iroquoian or Haudenosaunee peoples come from the member nations of the Iroquois League: Mohawk, Onondaga, Oneida, Cayuga, Seneca, and lastly Tuscarora, who were accepted into the league after they became refugees from their ancestral lands in the Southeast United States. In much mainstream media, Iroquois is depicted as a unique identity in and of itself, separate from the member nations of the Iroquois League. Cusick’s Sketches would seem to contribute to this misconception somewhat, since they present a largely singular Haudenosaunee narrative, and the manner in which they refer to different nations or factions can be confusing. But Cusick’s history also focuses primarily on events that occurred before, quote, “Columbus discovered the America,” end quote. Most non-Native depictions of Native stories and characters in Western media do not deal with Pre-Columbian peoples, and instead focus on the conflict-laden interactions between Native Americans and Euro-Americans in the 18th and 19th centuries. These are the types of stories we think of when we think of Native Americans, because these stories are overwhelmingly told by white authors who romanticize the Old West, or who have a savior complex, or who make use of Native characters and settings in order to enlighten or advance the stories of white main characters. Many of you listening might have become familiar with the Iroquois as a result of the 1980 book The Indian in the Cupboard, or the 1995 movie adapted from it. The story of the little plastic 18th century Iroquois man who comes to life when locked in a cupboard by a 20th century white boy is still considered a children’s classic to some degree, but it has also been the subject of controversy due to its stereotype-heavy portrayal of Little Bear, the titular Native character. In addition, it incorporates many other problematic themes common in mainstream portrayals of white people encountering Native Americans, including the white person as savior and the objectification of Native culture. In this case, it’s a literal objectification—the Native person is a literal object, whose personhood is only made possible through the actions of a white main character. The idea that Native people’s continued existence is thanks to white benevolence is something that Cusick’s Sketches counteract, simply by establishing that Native Americans had a long and rich history prior to European contact, and established a democratic system of government before Enlightenment ideas ever reached North American shores. Atotarho’s story in particular can be read as a kind of rejection of the notion that it is European intervention that quote-unquote “saves” Native peoples from savagery. Atotarho is transformed from tyrant to benevolent leader through the actions of his own people, not through white Christian intervention. Susan Kalter explores how Cusick rejects the notion of Native Americans as “savage” in greater depth, noting that, quote, “while Cusick rejects savagism, he evades others’ placement of himself and of the Iroquois into a uniform, composite version of Native American consciousness,” end quote. For Kalter, not only does Cusick resist the dominant Euro-American myth surrounding Native Americans, he also resists the erasure of individual Native American nations and tribes by emphasizing the Iroquois’s difference from other nations, in particular presenting them as, quote, “more ethical and stronger than surrounding nations,” end quote. These qualities push back against just the sort of stereotyping and white-savior nonsense that pervades media like The Indian in the Cupboard. We shouldn’t say that Cusick’s book, or even the single image of Atotarho, is some kind of antidote to these types of depictions, especially since contemporary Iroquoian people clearly object to some of the choices Cusick made in the Sketches. But we can look at it as a resource upon which to draw when constructing Native narratives in the future, and something to keep in mind when we look at how the Haudenosaunee are depicted in white media. A slightly different approach to depictions of Iroquoian peoples appears, interestingly enough, in video games. Assassin’s Creed III, developed by Ubisoft and released in 2012, featured a half-Mohawk main character named Ratonhnhaké:ton or Connor. Connor’s narrative is particularly relevant to discussions of David Cusick because his story revolves around his participation in the American Revolution, much like Cusick’s father. However, because of this Revolutionary backdrop, there is a limit to how much the player is able to explore Connor’s Mohawk background—the bulk of the game focuses on his relationship to the Euro-Americans’ revolution, and his childhood and adolescence in a Mohawk village are largely confined to the early game. According to an article on Time Magazine’s website prior to the game’s release, Ubisoft was dedicated to accuracy and respect, hiring a cultural consultant named Thomas Deer to ensure they avoided major errors. The same Time article points out Connor’s differences from other Native American video game characters, like the stereotypes populating fighting games like Mortal Kombat and Tekken. Assassin’s Creed III does deal with the place of Native Americans in relation to the dominant Euro-American society, but through a largely Native-driven, rather than a white-driven, narrative. Similarly, Cusick’s Sketches provide a Native perspective on the creation of the Earth and of humankind, but consistently refer to Columbus’s landing in the Americas as a reference point, and even make reference to the Bible, situating Iroquois stories within a Euro-American Christian framework. Cusick even makes use of Euro-American structures of language and technologies of image-making to elevate the visibility of Iroquoian traditions, just as Assassin’s Creed III takes a medium overwhelmingly dedicated to the stories of white men and uses it as an opportunity to highlight a Native story, although it is still designed and shaped by non-Native creators. Cusick’s Sketches are concerned with establishing Iroquoian autonomy in the face of potential erasure, both physically and narratively, by Euro-American perspectives on history. But Cusick, having grown up in a white Christian environment after the United States were established, still relies on those Euro-American perspectives. This is why, although we can certainly call the Sketches important, we can’t hail them as an unequivocal act of resistance against white colonization. There’s a lot more research to be done on Cusick, his book, and his images in order to elaborate on their nuances and find where they fit into both Native and white histories. Cusick’s Sketches, most notably the woodcuts that appear alongside them, work against the grain of Euro-American historical narratives, anthropological studies, and depictions of Native people and stories. Cusick’s depiction of Atotarho in particular pushes back against the misconception that Native Americans have no history before contact with whites, or at the very least no history worth illustrating. The meeting of Atotarho, Hiawatha, and Deganawidah is an event worth commemorating, even though Cusick is limited in his elaboration of the event, both visually and verbally. At the same time, the inclusion of the dog (whether intentional or not) helps to ground the meeting in reality, to lend a sense of the historical rather than the mythological to the scene. Yet that sense of the historical also extends to the clear Euro-American influences on the image and the Sketches in general—Atotarho sits on a European-style four-legged chair, for instance, and all of the content of the book is printed and bound in a European style. Regardless of philosophical questions about authenticity or more practical questions about the accuracy of Cusick’s re-tellings and whether they are infused with Christian teachings, his Sketches are a landmark object in the history of both Euro-American books and Native American art and literature. They are a testament to just how long disparate cultures, and cultures in conflict, have been cross-pollinating and creating new and different objects that challenge the status quo. Thanks so much for listening to Art History for All! You can find a transcript of this podcast with links to images and citations at arthistoryforall.com. 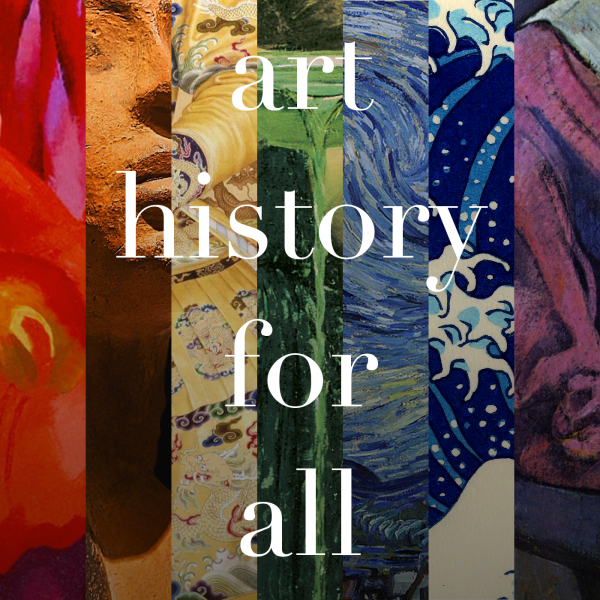 You can follow us on Twitter at arthistory4all, with the number 4. You can subscribe to the podcast feed on Apple Podcasts, Stitcher, or RadioPublic, and go ahead and rate it or tell your friends about it! Good ratings and word of mouth help us help more people engage with art history. If you really, REALLY like the podcast, please feel free to leave a tip on Ko-Fi, at ko-fi.com/arthistoryforall. This podcast was produced and narrated by me, Allyson Healey. The theme was composed by Bruce Healey. Credits for other background and interstitial music can be found in the podcast description or at the end of the transcript. Stay tuned for the next episode at the end of December, and remember to look closely: you never know what you might see. “Tadodaho.” The Wikipedia article heavily cites Jean Houston and Margaret Rubin’s Manual for the Peacemaker: An Iroquois Legend to Heal Self and Society (Quest Books, 1997). William C. Sturtevant, “David and Dennis Cusick: Early Iroquois Realist Artists,” American Indian Art Magazine 31, no. 2 (Spring 2006): 47. Phillip H. Round, “Chapter Eight: Indigenous Illustration,” in Removable Type: Histories of the Book in Indian Country, 1663-1880 (Chapel Hill: University of North Carolina Press, 2010): 213. Neal B. Keating, Iroquois Art, Power, and History (Norman: University of Oklahoma Press, 2012): 136-137. Keating, 140, and Wikipedia contributors, “Hamilton College,” Wikipedia: The Free Encyclopedia, accessed 13 November 2018. https://en.wikipedia.org/wiki/Hamilton_College. Round, 214, and Sturtevant, 48. Susan Kalter, “Finding a Place for David Cusick in Native American Literary History,” MELUS 27, no. 3, Native American Literature (Autumn 2002): 9. “You’re Right But I’m Me” by Doctor Turtle, via freemusicarchive.org. Licensed under a Creative Commons Attribution 4.0 License. “Under the Stairs (Instrumental Version)” by Josh Woodward, via freemusicarchive.org. Licensed under a Creative Commons Attribution 3.0 License. “Completely Lost” by Lee Rosevere, via freemusicarchive.org. Licensed under a Creative Commons Attribution 4.0 License.